Today's cartoon reaches WAAAYYYY back about 15 years. You'll notice a significant difference in the way the characters look, especially the son. I'm going to be mining my own past for several weeks. I have a publishing arrangement that is in development and it is requiring a very large commitment of time. Pardon me for sounding so cryptic, but I've agreed not to say anything else until the contracts are signed, etc. Let me take this opportunity to thank all of you who read my cartoons. I can't express what your readership means to me and I'm really lousy at those kinds of public display. Big things coming in the next year, so stay tooned! 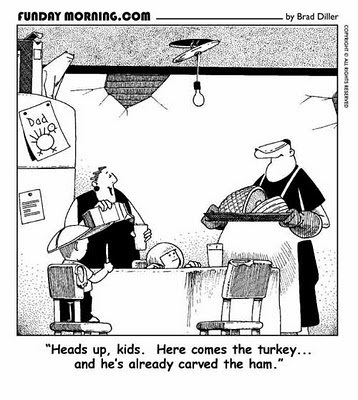 I hope you all have a great Thanksgiving. See you next Tuesday!